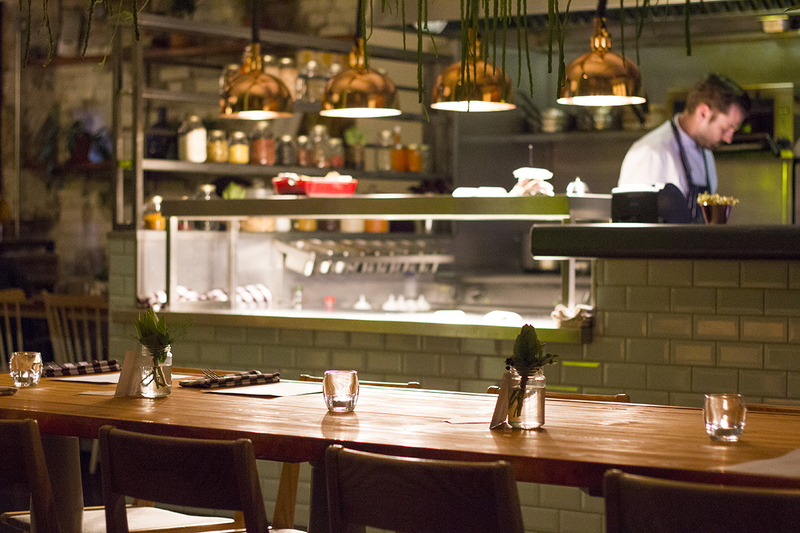 Nestled in amongst the so-called ‘dirty’ burger joints that have reignited Manchester’s passion for casual dining once again, there’s been a few places popping up that are a little bit different. And then finally I was 100% sold, after seeing Katie, Caroline and Pamela share a little peek at what Northern Quarter-based Evelyn’s was serving up. 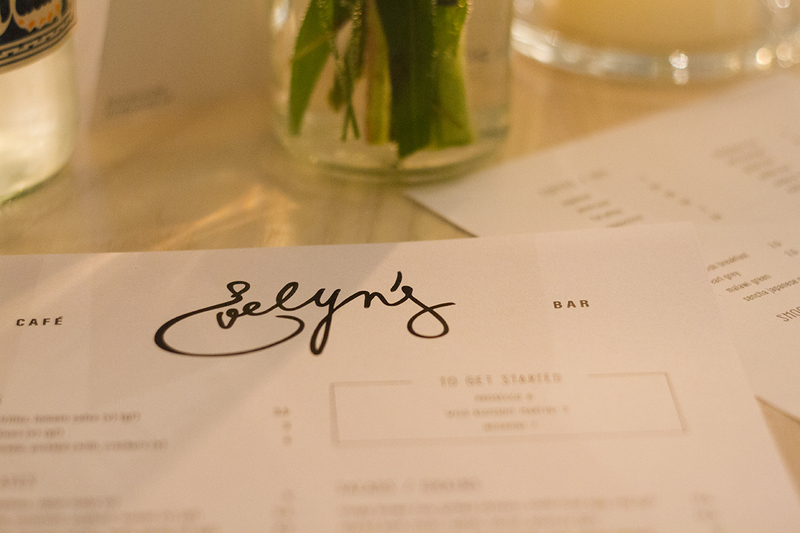 I decided to make Evelyn’s top of my list for my next dinner out in Manchester. Evelyn’s takes over the former Superstore restaurant over on Tib Street, with a few changes made to give it the feel of a friendly, neighbourhood restaurant. 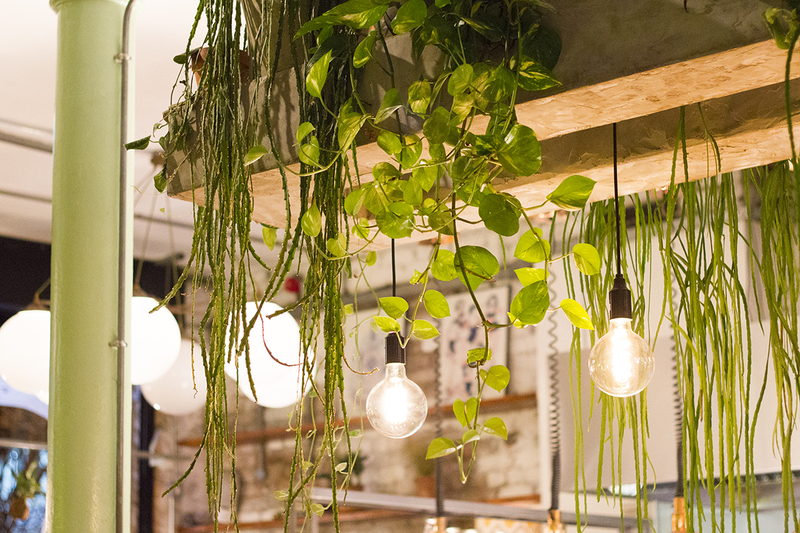 There’s plenty of greenery, which is apt considering the great selection of vegan and vegetarian options on the menu, as well as quirky light fittings and an open kitchen. I came here for dinner with my friend Caroline and we instantly felt at home. It was a weekday evening, but there was still a nice buzzy atmosphere without being noisy. I imagine that during brunch hours, there’s loads of beautiful natural light flooding the place too. I was going to stay safe with some soft drinks, but after spotting the words ‘espresso daiquiri’ on the menu, I couldn’t hold back. 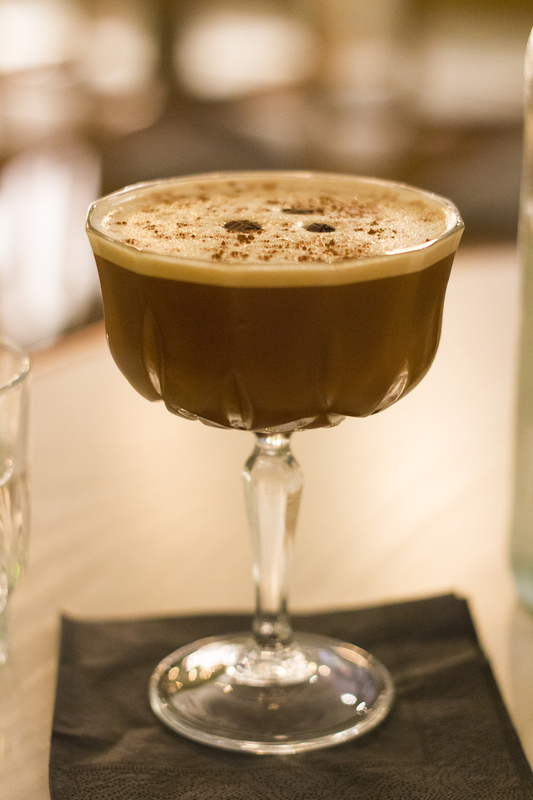 An espresso martini is my cocktail of choice, so a daiquiri version (with rum in place of vodka, I’m guessing!) sounded lush. One thing I have to say, is that despite not really being a coffee specialist, the coffee is top notch at Evelyn’s. The flat white I had to finish the meal was so tasty, as was the espresso daiquiri cocktail (£7). 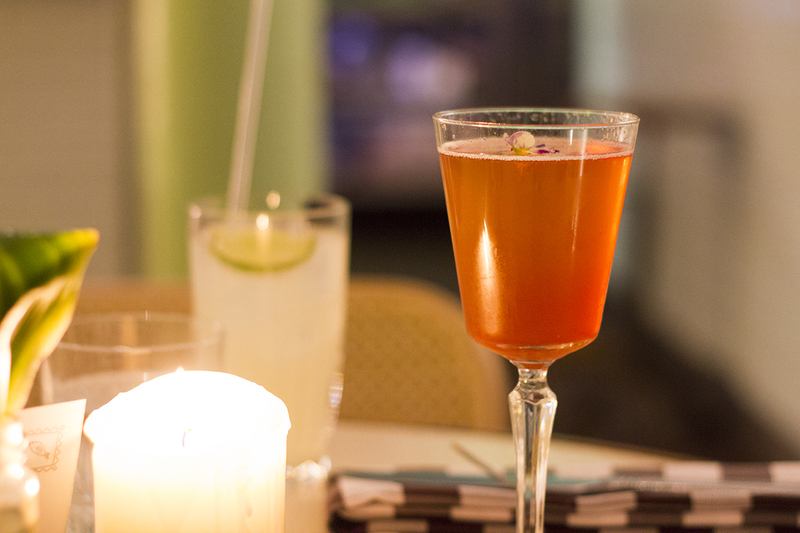 Caroline opted for the English 75 cocktail (£8), featuring an Earl Grey syrup and prosecco, which was a fruity delight. Next time I’d love to try their tropical caipirinha (£7) too! Both of us had our starters picked out way in advance of the meal, after Caroline’s previous meal there the week before and my obsessive stalking of Evelyn’s on social media. We were so prepared for the waitress. I went with the sweetcorn fritter with tomato salsa (£3.50), which comes under the ‘snacks’ section of the menu. If you’re not looking for a huge, massively filling meal or you want to make sure that you 100% still have room for dessert (me), then this is a really perfect sized starter. 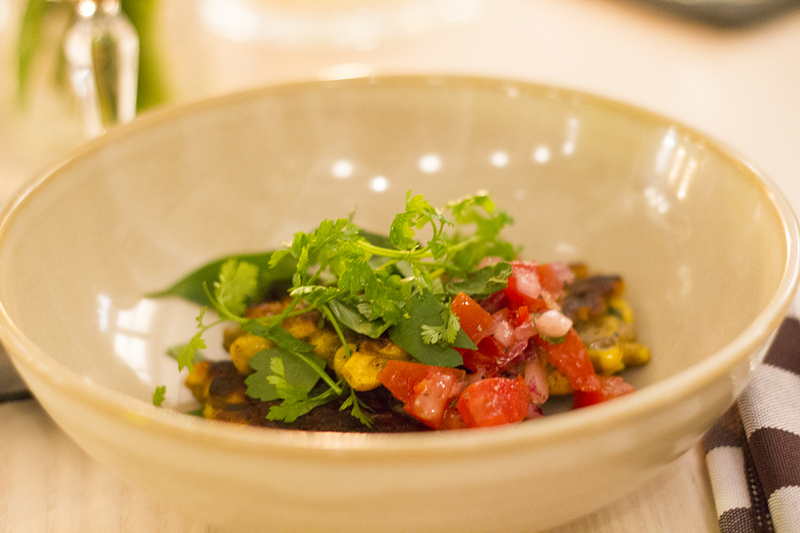 It was also incredibly tasty, with the tomato salsa adding a beautiful freshness to the fritter. I must’ve raved about this starter to Mat at least 3 times when I arrived home. I probably should’ve ordered two portions. 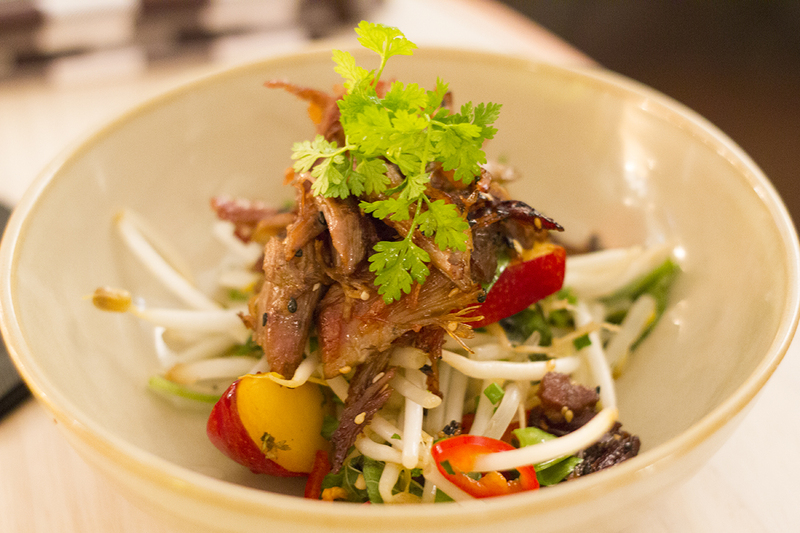 Caroline had the crispy duck, sesame and plum salad (£7.50) which I got serious food envy over. The Asian influences on the menu are really apparent, especially in dishes like this one, and it’s great to see them packed full of healthy but equally tasty veggies and fruit. The portions are so perfect and you’ll never arrive at your main course feeling full or hungry, which is ideal. We both went fishy with our main courses, with me choosing the seared mackerel (£14) and Caroline having the roasted salmon salad (£12.50). The choice of fish dishes is great here and it was a real toss-up for me between the mackerel and the sea bream, which both sounded amazing. The mackerel won out in the end but I wasn’t disappointed in the slightest. 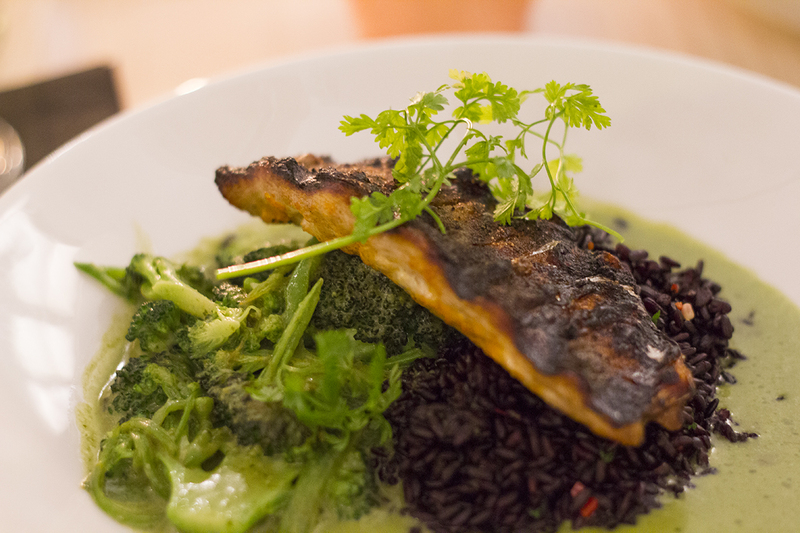 It sat upon a bed of black rice, green vegetables and was surrounded with the most delicious green sauce. The sauce definitely had some Asian influences, possibly Thai, and worked so well with the crispy and flavoursome fish. 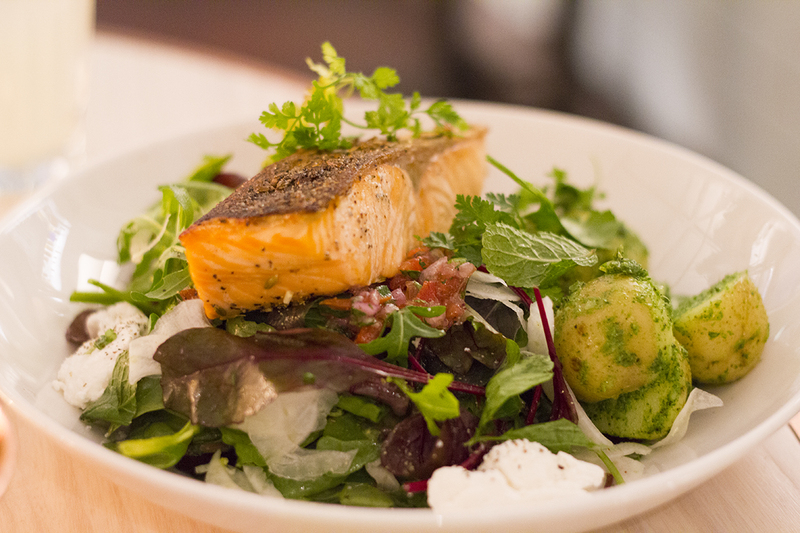 Caroline’s roasted salmon salad was exactly how a salad should be: huge. It included plenty of leaves, a sizeable fillet of fresh salmon, potatoes, cream cheese and salsa. 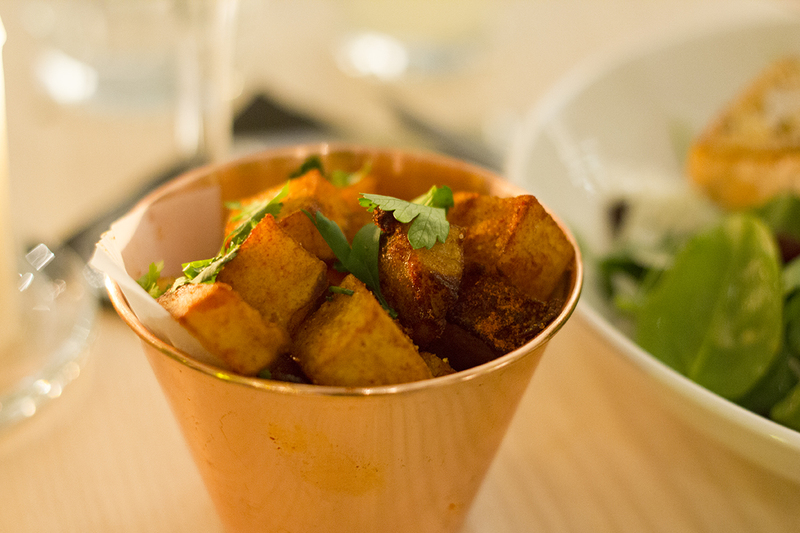 We also shared a side of the chilli & garlic homefries (£4), which are a tasty little must-have for a meal at Evelyn’s. You can always count on me to be that girl who has dessert, even when everyone else is regretting wearing skinny jeans and wondering when they will ever want to eat again. Although indulgent, the dessert offering sits perfectly with the rest of the menu by not being loaded with artificial sugars. 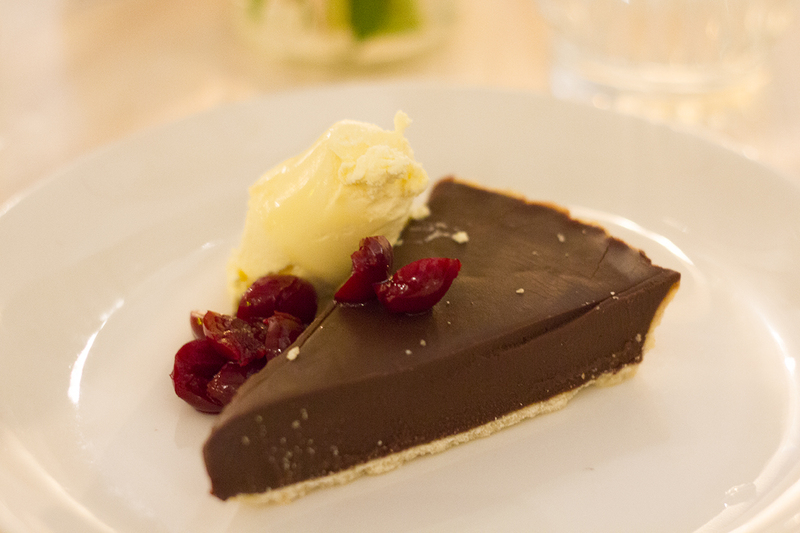 I’m immediately drawn to anything with chocolate, so the chocolate tart with cherries and cream (£5.50) was the one for me. This actually wasn’t my favourite part of the meal, as I found the rock solid pastry a little bit difficult to eat. But that being said, the chocolate ganache was incredibly thick and rich, and the cherries worked well with the chocolate. Caroline’s dessert of apple crumble (£4) was a much more impressive moment of the meal though, with the crumble being served for a huge oven dish at our table. 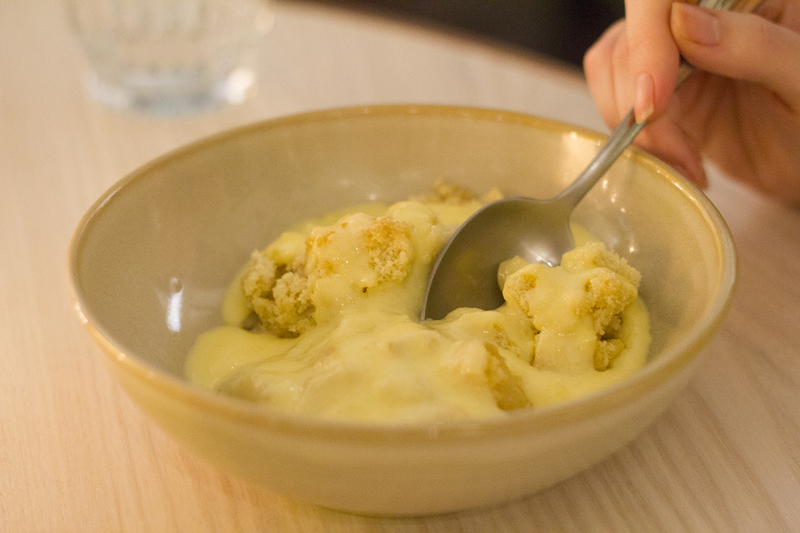 They poured the creamy custard on and it really did feel like she was being served someone’s nan’s homemade recipe. A lovely end to a lovely meal! The service is attentive & friendly, without being intrusive, the atmosphere is relaxed & cosy and the food is incredible. When I say that I’ll be back again soon, I really do mean it as I’ve already been back once since I had the meal above! I already know that Evelyn’s is going to be a regular favourite in my list of best Manchester restaurants. Find the full menu on their website here. 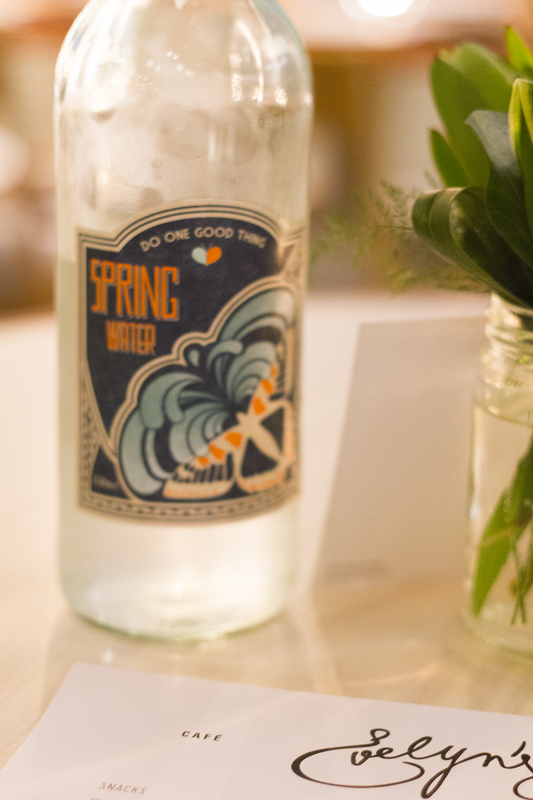 Have you been to any new restaurants lately? Let me know if there’s any you’d like to see me review!